4 Welcome to Isaiah 45, I hope you enjoy reading this Book of Isaiah. But before we get right into Isaiah 45 let us give homage to our Lord and Savior Jesus Christ and after doing this we can read Book of Isaiah. 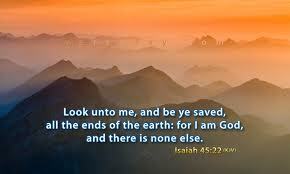 22 “All of you who live anywhere on earth, turn to me and be saved. 45 “Cyrus is my anointed king. I take hold of his right hand. to bring nations under his control. to go to war against him. I break city gates open so he can go through them. 2 ‘I will march out ahead of you. I will make the mountains level. I will break down bronze gates. I will cut through their heavy iron bars. 3 I will give you treasures that are hidden away in dark places. I will give you riches that are stored up in secret places. I am the God of Israel. I am sending for you by name. 4 Cyrus, I am sending for you by name. I am doing it for the good of the family of Jacob. I am doing it for Israel. They are my chosen people. But I am giving you a title of honor. 5 I am the Lord. There is no other Lord. 6 Then people will know there is no God but me. 7 I cause light to shine. I also create darkness. I do all of those things. I am the Lord. 8 “‘Rain down godliness, you heavens above. Let the earth open wide to receive it. Let freedom spring to life. Let godliness grow along with it. I have created all of those things. 9 How terrible it will be for anyone who argues with his Maker! He is like a broken piece of pottery lying on the ground. “You don’t have any skill”? 11 The Lord is the Holy One of Israel. “Are you asking me about what will happen to my children? Are you telling me what I should do with what my hands have made? 12 I made the earth. I created man to live there. My own hands spread out the heavens. I put all of the stars in their places. 13 I will stir up Cyrus and help him win his battles. I will make all of his roads straight. My people have been taken away from their country. But he will set them free. I will not pay him to do it. “You will get everything Egypt produces. and the tall Sabeans get in trade. All of it will belong to you. And all of those people will walk behind you as slaves. They will be put in chains and come over to you. They will bow down to you. 15 You are a God who hides yourself. You are the God of Israel. You save us. 16 All those who make statues of gods will be put to shame. They will be led away in shame together. 17 But the Lord will save Israel. He will save them forever. They will never be put to shame or dishonored. That will be true for all time to come. 18 The Lord created the heavens. He formed the earth and made it. He set it firmly in place. He didn’t create it to be empty. Instead, he formed it for people to live on. He says, “I am the Lord. 19 I have not spoken in secret. I have not spoken from a dark place. I am the Lord. I always speak the truth. I always say what is right. Gather together and come into court. would carry around gods that are made out of wood. They pray to gods that can’t save them. 21 Tell me what will happen. State your case. Who spoke long ago about what would happen? Who said it a long time ago? I did. I am the Lord. 23 I have made a promise with an oath in my own name. I have spoken with complete honesty. ‘Everyone’s knee will bow down to me. 24 They will say, ‘The Lord always does what is right. All those who have been angry with the Lord will come to him. 25 But the Lord will help all of the people of Israel. He will make them right with himself. And they will praise him.